Matt McKeown from First UB church in Holly Hill, Fla., leads a time of worship. Fifteen ministry couples are gathered in Daytona Beach for fellowship, relaxation, and mutual stimulation. Yesterday, we dealt with the question of our heart’s condition, spiritual disciplines, and cultivating friendship while ministering to others. Today we’re wrestling with numerous cultural shifts and how our principles and values may need to be expressed in new ways so that the mission of God, to make and multiply disciples, remains at the forefront of our ministries. 26 Oct Nov 6-7: Pastor Resource Day in Chambersburg, Pa.
A Pastors & Wives Summit is underway in Daytona Beach, Fla., with 32 people attending. They include 13 senior pastor and spouses from churches of 300+ attendance. 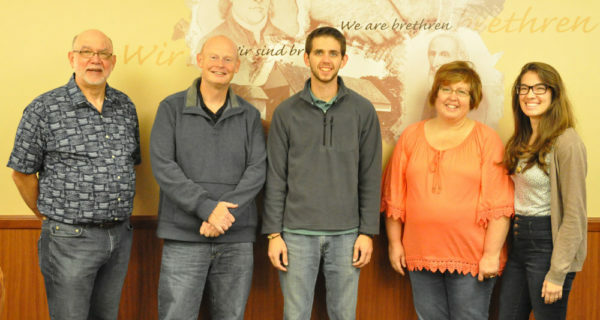 They are joined by three couples from the National Office: Bishop Todd and Lisa Fetters, Global Ministries director Jeff and Charlene Bleijerveld, and National Ministries director Mike and Pam Dittman. The event began Monday night and will conclude on Thursday. The Executive Leadership Team, during its October 17-18 meeting, approved the Pastoral Compensation guidelines for 2017. Many United Brethren churches use this formula to set salaries and budgets for the coming year. The 2017 minimum fulltime salary (called Standard Base Salary) for senior pastors was set at $38,756, which is a 1% increase over 2016. This is a minimum. Churches are encouraged to go beyond the minimum. This year, the guidelines also provide figures for 1.5% and 2% increases. The Standard Base Salary is only the starting point. Other factors—such as experience, education, church attendance, and staff size—add to the base salary. Questions have been coming to the National Office about overtime pay for church employees. The Fair Labor Standards Act (FLSA), though designed for businesses, also applies to churches and other ministries. The Fall 2016 edition of The Deacon’s Bench, a newsletter from Brotherhood Mutual, does a thorough job of explaining how the FLSA applies to churches, especially regarding overtime pay. You can download that issue here. Criteria for determining if the FLSA applies to your ministry. Clergy members are not specifically exempted from the FLSA. The three tests which determine whether or not an employee is exempt from the FLSA. What the FLSA requires regarding overtime pay. Penalties for violating the FLSA. How to reduce your liability. The newsletter explains a “ministerial exception” which “is intended to apply to pastors, ministers, or other employees who are ordained or who function in a similar religious capacity.” Five criteria are given for classifying someone as a minister. Hired largely on the basis of religious criteria. Authorized to perform church ceremonies. Recognized by your ministry as a clergy member. Engages in religious activities as part of the job. Is required to follow a process such as licensing, ordination, etc. The newsletter also discusses church record-keeping, and how the FLSA applies to educators. Pastor Charles Simmons (right) passed away October 17, 2016, at age 77. He served 21 years as senior pastor of Liberty UB Church (Stockport, Ohio) before retiring in 2015. Funeral time: 11 am on Friday, October 21. L-r: Bob Bruce, Jeff Lawson, Brandon Groff, Christine Augustat, and Holly Lutton. Jeff Lawson, lead pastor of Hopewell UB church (Auburn, Ind.). Brandon Groff, a Huntington University graduate who is now Student Pastor at Fowlerville UB church (Fowlerville, Mich.). Christine Augustat, Children’s Pastor at Fowlerville UB church (Fowlerville, Mich.). Holly Lutton, a Huntington University graduate who is Youth Ministry Assistant at College Park UB church (Huntington, Ind.). Milton and Erika Pacheco with Rosanna Dunn. Milton and Erika Pacheco, a Honduran couple, are in the States this fall raising support as they prepare to become United Brethren missionaries in Thailand. A few days ago they had the opportunity to visit Rosanna Dunn, the maternal grandmother of Brian Glunt, one of their Thailand team members. 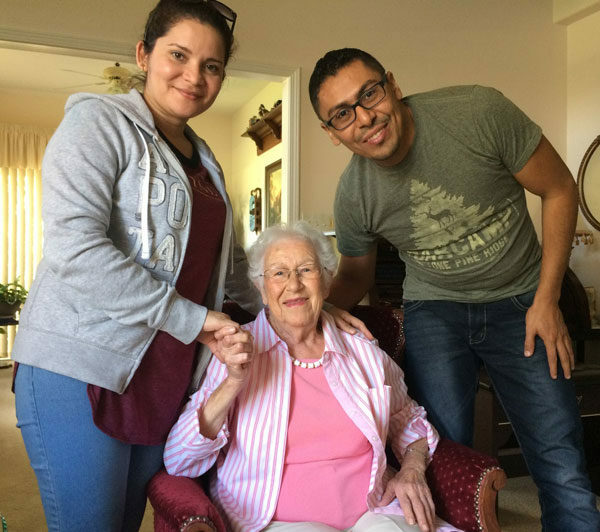 Rosanna, 93, is supporting the Pachecos financially and through prayer. 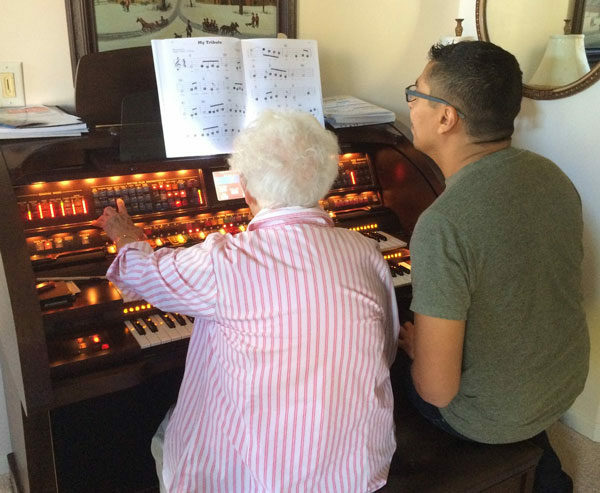 Rosanna, who lives north of Indianapolis, started learning to play the electric organ in her 80s. 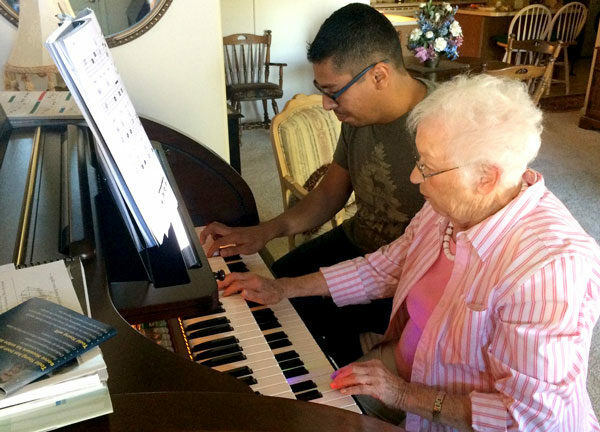 she and Milton, a talented musician, were able to have a little jam session. Kyle McQuillen (right) was a UB missionary in Sierra Leone, and served as Director of Missions 1993-2001. He retired in Florida, but has remained active in ministry with a prison and a church. In 2011 he was diagnosed with non-Hodgkin’s lymphoma, and began aggressive chemotherapy which lasted until April 2012. On October 15, 2016, Kyle posted on Facebook an update on his physical condition. Here is some of what he wrote. “On April 15 of 2012, my cancer went into remission, but because the cancer had adversely affected my immune system, I continued receiving treatments for the next several years on a regular basis. At the present time, I go to oncology every three months to receive an infusion of IVIG to build up the immune system. As far as we can tell, there is no cancer at the present time. “Over the years I have suffered with back problems, having had two back surgeries, laminectomies in 1972 and 1980 and then another one, a fusion, in 2011. Because I suffer from spinal stenosis, I am going back in for surgery on Tuesday, October 25, at the Florida Hospital in Ormond Beach, Fla. Two neurosurgeons will work on my back and seek to build a cage which will enable some stability in the L3 L4 area of my back, which at the present time suffers from a condition known as the sequester disc…. Matt McKeown (right), a pastor at First UB church in Holly Hill, Fla., sent a report about Hurricane Matthew and its aftermath. This came on Friday afternoon, October 14. Tree removal was be a major expense. 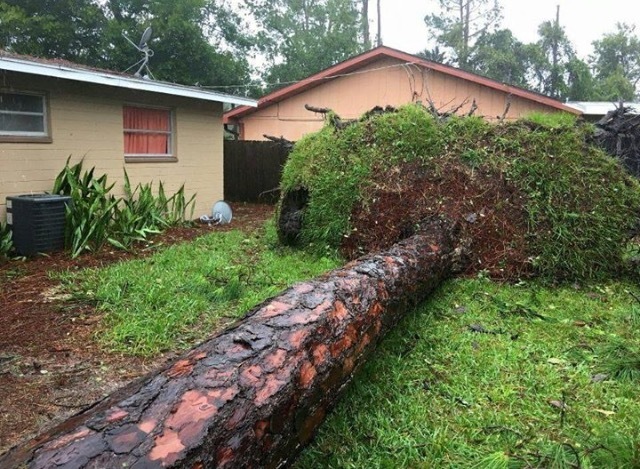 “Hurricane insurance does not cover the removal of downed trees. We’ve got a dozen or so of those. Removal of one tree can be up to $2000, especially these big Southern yellow pines that are 100 feet tall. “We just bought a building to expand our recording studio, and one of the selling points was the big lighted sign at the roadside. It was destroyed by the hurricane, and it is not covered by insurance…. “It’s a bit of a racket, honestly. The premiums are so large for hurricane insurance that most people can’t even afford to have wind damage insurance on their buildings. Plus, if the wind blows the roof off of your building, and the rain destroys your property, your hurricane insurance does not cover the damage from the rain because you lost your roof. It only covers the replacement of your roof. But even then, the deductibles are so high there’s no point in making a claim. Gary Vanderveen, pastor of Faith UB church in nearby Port Orange, Fla., reports that they came through the hurricane very well, with only minor cleanup needed. The Pastors and Spouses Summit for churches with 300+ attendance is scheduled for October 24-27 in Daytona Beach. The location had to be moved because of damage to the original hotel. However, everything is working out. They’ll be able to meet at an even nicer hotel which is closer to First UB church. Pastor Chuck and Vicki McKeown of First UB are among the persons who will attend this event.